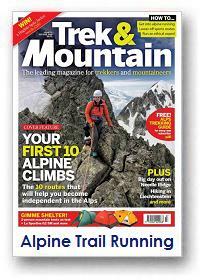 You only need to scan through the running magazines and forums to get an idea of how popular trail running is becoming. 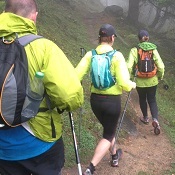 We have been offering these Alpine trail running weeks for many years, to help people get into this fascinating and totally addictive sport. 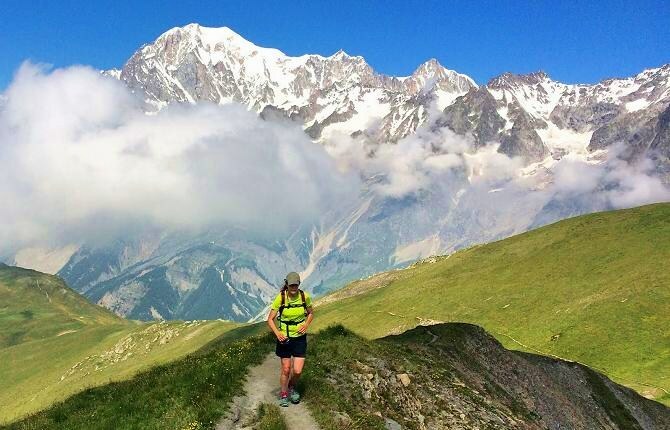 Our week long Alpine trail running weeks are based in Chamonix, at the foot of Mont Blanc, as there are hundreds of kilometers of trails to choose from. 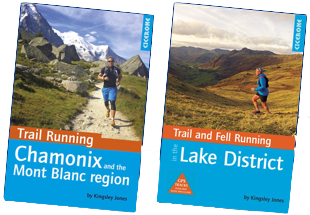 We offer a great balance of running, coaching, and trail running advice, preparation and top tips. Many people repeat these weeks year after year!. 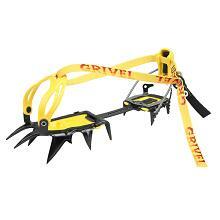 As well as enjoying a great week of trail running of c. 10 - 15km a day at a nice steady pace, we aim to teach you the key safety skills for route planning and Alpine running, with a focus put on the selection of equipment and how to develop your training plans for trail running. Don't worry if you have never run on trails before, as you will pick up the skills quickly with expert coaching and guidance. All you need is to be fit for regular running, to have a sense of humour, and to love the outdoors. We will teach you the rest, and you are guaranteed a great and fun holiday! 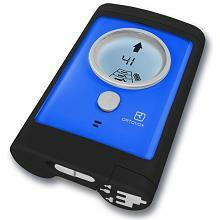 You are led and coached by a Personal Trainer, who is also an International Mountain Leader. 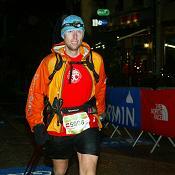 Most importantly they will be a passionate trail runner who has competed in plenty of Alpine ultra running races, possibly even the Ultra-Trail du Mont Blanc. 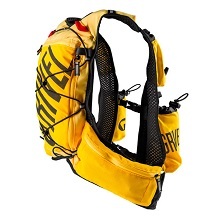 You are led by a genuine expert in ultra-trail running. 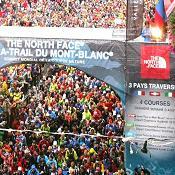  If you book on our June running week at the end of June, you have the amazing opportunity to watch or even participate in one of the Marathon du Mont Blanc race events which include; vertical kilometer, 10km, 23km, marathon, or 80km. The events are scheduled on the Friday to Sunday. Click on website link for details. 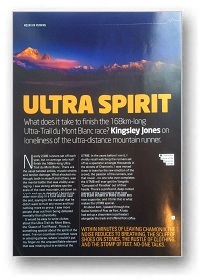  On the last week of September, you overlap with the Ultra Trail du Mont Blanc race series week, with the main UTMB set off on the Friday evening. The atmosphere in Chamonix this week is electric! 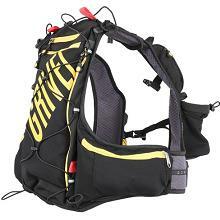 We always try and ensure that this week you are led by a UTMB finisher, so they can give you all the race gossip. 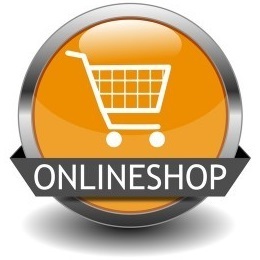 Website link. 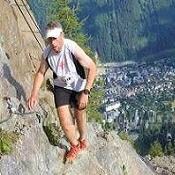 Not only will you enjoy a week of running on some of the best trails in the Chamonix region, but you will have gain a huge amount of tips and advice for performance guidance, efficiency of gait, mountain techniques, and safety skills, so you leave the week feeling more inspired and better informed about trail running than ever before. Chamonix is blessed with hundreds of kilometers of trails over all types of terrain, from forest tracks to high alpages and mountain passes, and so the itinerary can be flexed on any day to take account of weather conditions, to ensure that you sample the best on offer. 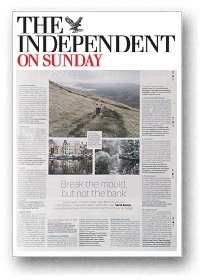 The itinerary below is to provide you with a taster of what you could achieve, and isn't fixed in stone. As far as the distances run each day, we advertise c. 10 - 15km each day, though try and select routes to cater for people to opt out of sections if they would like an easier day. We aren't expecting you to be mountain running machines, just a great spirit of loving the mountains, and wanting to give it a go. Speed is nothing. Enjoyment is everything! Many clients come back year after year to repeat this Alpine trail running week, but they need never repeat a trail they have run before. 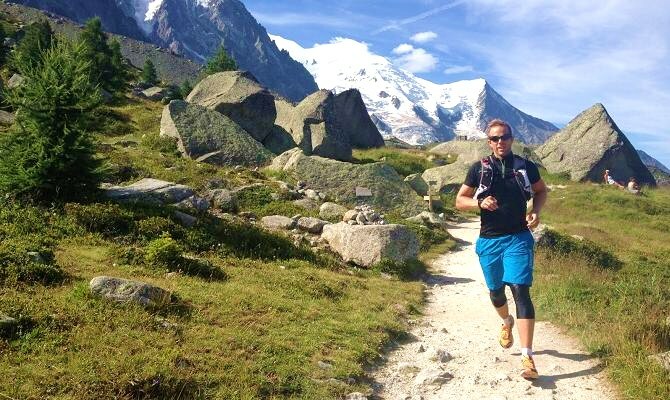 A classic trail run in Chamonix, such as up to Montenvers, and Signal Forbes above the Mer de Glace glacier basin, then across to Plan d'Aiguille, then the option of running down to Chamonix, or taking the cable car. 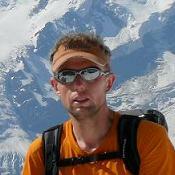 The key focus of the day is to develop different running techniques for varied terrain types, especially how to run up the hills. Night in Chamonix. 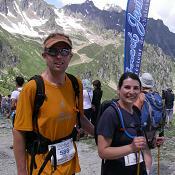 Highlight - running the amazing balcony trail overlooking the whole Chamonix valley. 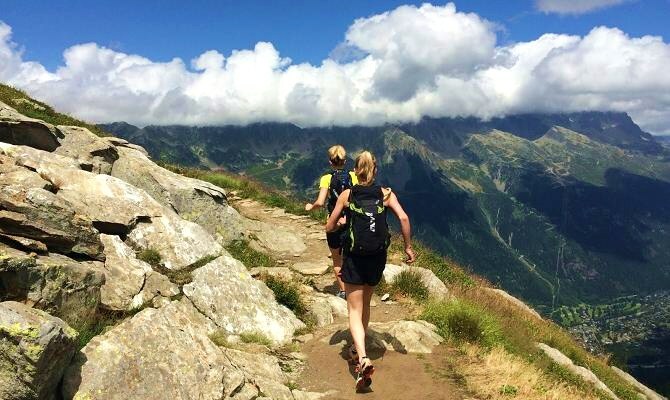 The focus is on building your trail running skills in more mountainous terrain, and a great choice is a traverse of the Aiguilles Rouges nature reserve. 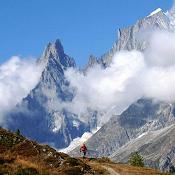 Running to the glacial lakes of Lac Blanc and Le Cheserys are stunning viewpoints. If your legs are feeling slightly tired after the previous day, there are cable cars you can opt for (up and / or down). Night in Chamonix. Highlight - gaining autonomy skills trail running in unspoiled stunning scenery. We take the picturesque Mont Blanc express train from Chamonix to Vallorcine, and run a section of the Chamonix Mont Blanc marathon to Montroc or further to Le Tour. You can even divert and take in the Col du Balme, or even the Croix de Fer, just across the Swiss border. 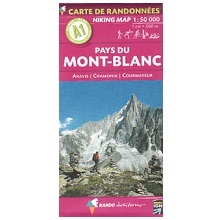 Alternatives are to traverse the Col du Salenton, or run up Mont Buet. Night in Chamonix. 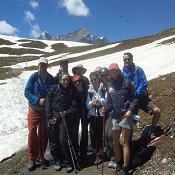 Highlight - running over the Aiguillette des Posettes with Mont Blanc ahead of you. 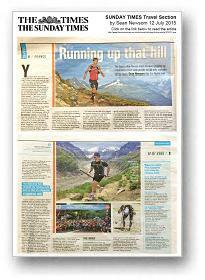 A day running in Italy or Switzerland, to run on sections of the UTMB route. 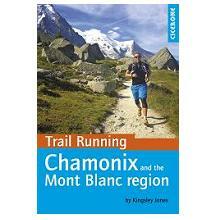 The day provides really different views of the Mont Blanc massif, and experience running in a different country. A popular option is running the UTMB / CCC route over the beautiful ridge of the Mont de la Saxe to visit the Rifugio Bonatti for a proper Italian hot chocolate! Night in Chamonix. A slightly longer trail run, to really put all the elements together that you have learnt over the week. 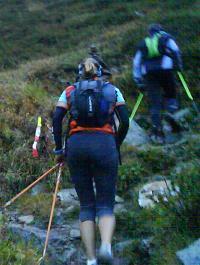 Often the group opts for a more technical route, such as running the Chamonix Vertical Kilometre. If you've the energy, after a short rest, you could continue over the summit of Le Brevent 2525m, and down via the Bellachat mountain hut. Night in Chamonix! 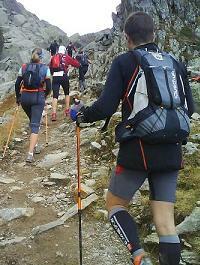 Highlight - completing a skyrunning race route on rough technical Alpine trails. Group sizes: 2 - 8 people per UIMLA guide. If there are more than 8 people on a week, separate groups operate, so you are guaranteed good access to the guide for tips and coaching. 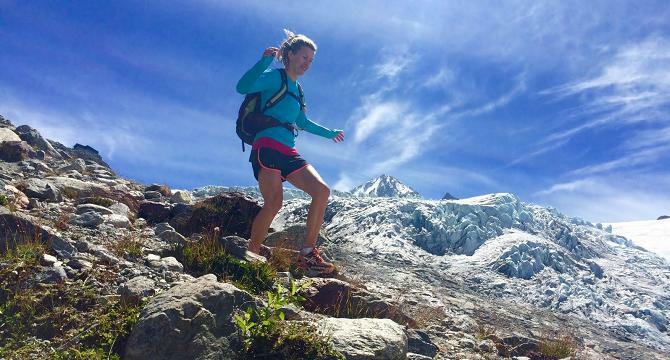 A photo gallery of images shot on our Chamonix Trail Running courses and races in the Mont Blanc massif, so you can see the range of terrain and amazing landscapes you will run in. 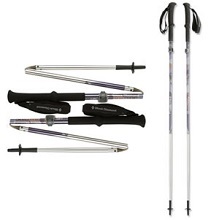 We stock these innovative and unique running poles in our Windermere shop, and are the only UK stockist. 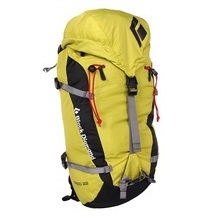 They were developed specifically for trail running (though they are great for ski touring and hiking too), and only weigh in at an incredibly light 169g for the unisize 125cm pole. 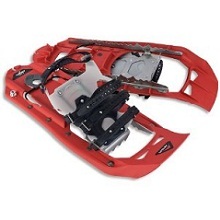 We have tested these poles and find them extremely durable, and the multi-grip handle extending down the shaft reduces vibration and excels on traverses. 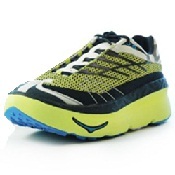 All our running clients are offered a 'try before you buy' scheme where you can test a pair, and as with all technical gear, there is a client discount. 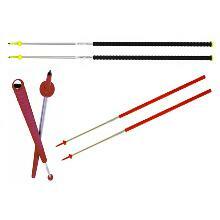 View poles on shop website; click here. 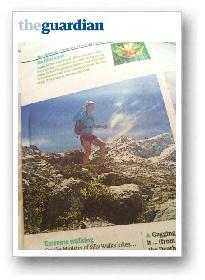 There are several other operators who also offer guided trail running, and we aren't afraid to advertise that fact. Please look at their itineraries to see how they differ from ours. 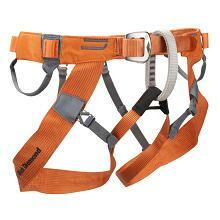 Our prices offer you great value. We genuinely believe that you'll spend more time actually running and in the mountains on our courses, than with anyone else. 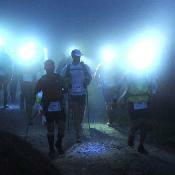 Anyone leading you will be a finisher of one of the iconic trail races, such as the Ultra Trail Mont Blanc / Tor du Geants / Leadville / WS100.